When disasters strikes, a home inventory list cannot just save time but also ensures you’re getting what you deserve from your insurance company. A home inventory list is a detailed document illustrating all belongings from the house. So, in case of a disaster such as fire, robbery or flood you are able to fast recall lost items. This will allow homeowner´s or renter´s insurance to replace these items in a timelier manner. After an emotional and difficult recovery time, the home inventory list is one less thing on your mind to worry about and it will ensure a smoother recovery process. As mentioned before, the home inventory is a simple list of all belongings in the house, including details such as costs of the items and when it was bought. Today, we are fortunate to be able to make quality videos with many of our smart phones. Make sure you capture every room, describe in details what the viewer is seeing and record from multiple angles. Don’t forget to open dressers and closet doors to allow a view of items inside the cabinets. Secondly, create a written list of all valuables, including purchase details that you may have. The video/pictures, as well as the list, should be stored off-site and need to be updated annually. 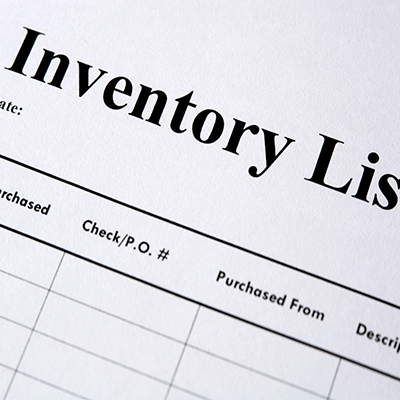 There are several supporting resources you can use to create your home inventory list. Those include online resources such as FDFS Homeowner´s Insurance Toolkit, which includes checklists and information regarding insurance coverage and the Real Simple Home Inventory Worksheet, which offers room-by-room fill-in-the-blank charts. Different software programs are available for you as well such as “Neon Sandbox”, a web-based software including free and secure cloud storage of your lists and allows you to track items and provides capacity for unlimited photo and document storage. Here is a helpful link to multiple home inventory software solutions >> for you to chose from. Mobile devices can be used for the creation of a home inventory lists as well. Click here to review a list of the top home inventory apps available for both Mac and Android users. Also, many insurance companies have simple home inventory list options. You might want to check with your insurance agent as well. All these useful resources require you to kept your list up to date, because the truth is, you never know when you’ll need the list.